White Gloria Astilbe is a great choice for shady gardens. It forms a compact mound or lacy blue-green leaves. Soft pink feathery plumes rise above the foliage during mid to late summer. It will grow to a height of 24" to 30" and 18" to 24" wide. Divide plants every 2 to 3 years in spring. 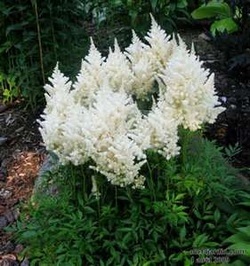 White Gloria Astilbe likes to be planted in shade. Use this perennial in tub, mixed containers, moon garden, woodland, or shady gardens. White Gloria Astilbe is excellent for cutting. The seed heads may be removed after the blooms have faded or they can be left on the plant for winter interest. This plant is also deer resistant and the flowers attract hummingbirds.